Wow – So you want to be an Enchanter? So you want to be an Enchanter? Enchanters place magical properties on armor and weapons to enhance them. But learning the skill is unlike any of the other professions in Wow. Other professions fall into two categories: Gathering, Creating. Gathering professions are like skinning, mining or herb gathering in that you progress through the world doing your skill and as you do, you achieve more proficiency at that skill – you level up your profession. Creating professions like Leatherworking, or Tailoring or Blacksmithing use the products of gathering professions and then make things. As you progress in skill you make more complicated things using higher level materials. Creation professions each come with their own Gathering profession, except for Tailoring, since the cloth is just dropped by creatures killed in the world. But Enchanting is different in several ways, some of them frustrating. 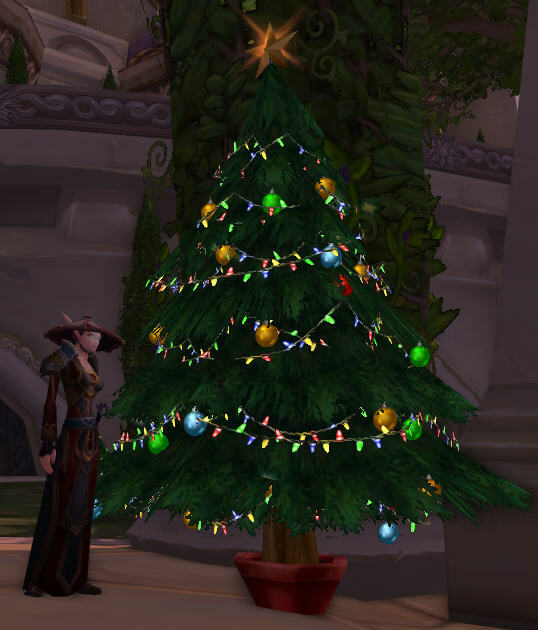 Here I am standing by a Winter Festival tree in Dalaran. Dalaran is a lovely floating city with all kinds of services floating in the center of Northrend, near Icecrown, the fortress of the evil Lich King, Arthas. So the first question is why become an Enchanter. Beyond the obvious benefits of being able to enchant the items for me and all my siblings, there is a more pressing need. It seems that Stormvein, our Warlock brother, is leveling his tailoring and of course we would all like larger bags to carry and store out stuff, so he would like to build us all 20 slot Frostweave bags, to replace our 16 slot Netherweave bags that he made a few months ago. But Frostweave bags require Imbued Frostweave, which require Infinite Dust, which is not easily available. But Enchanters can disenchant this dust from certain items. So it turns out that the dust can be reasonably obtained by disenchanting Horned Cobalt Helms that can be cheaply made by mining Cobalt and then Blacksmithing the helms. 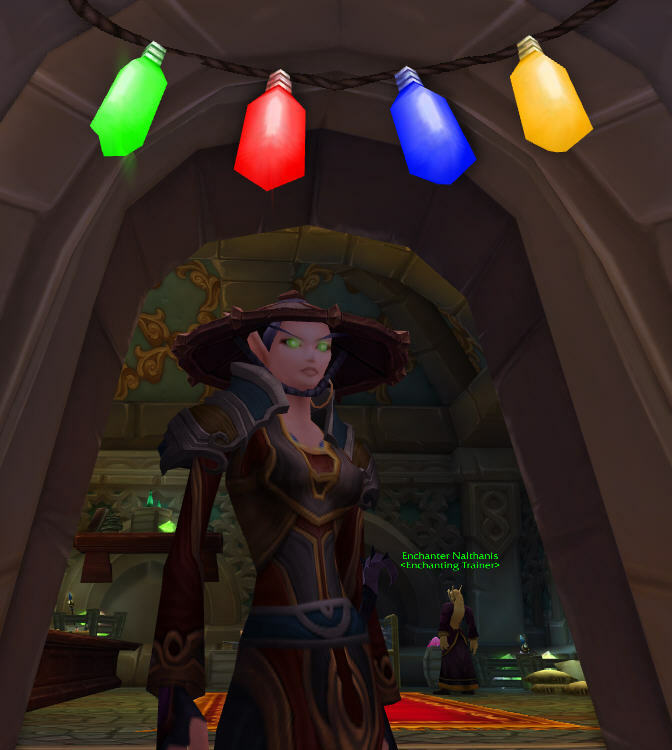 Candravia has been collecting the Frostweave cloth, and I need to learn a high level of Enchanting to disenchant the helms. Adamithus will mine the Cobalt, which he can already do since he is a quite an accomplished miner, and Margrog will blacksmith the helms. However, the folks that designed Enchantment Magic apparently were spending too much time gathering herbs along the way, if you get my drift, so learning Enchanting is very strange. To Enchant an item, you must first have some magical materials, and these can only be obtained from other items by disenchanting them. Ok so far so good. But the problem is that the higher level enchants often require lower level magical materials. 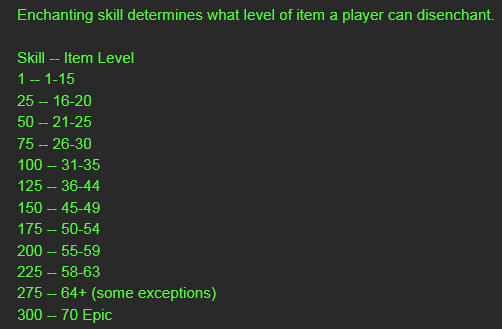 This means that the materials that you obtain from disenchanting items at your level don’t help level you up. This is unlike any of the other professions, which are straightforward in their leveling. Also it turns out that disenchantment only increases your skill until about level 50. 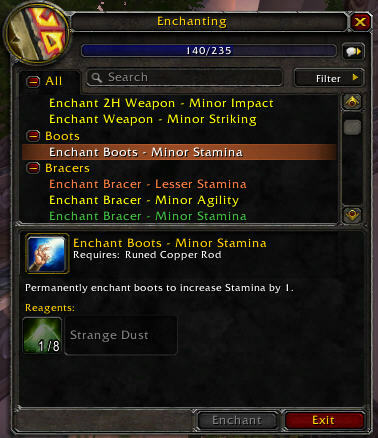 At each level of Enchanting, you can disenchant items up to a certain level. To build your skill in enchanting you need to make enchantments of an appropriate level. The orange ones you learn from the trainer. When you progress far enough they become green or gray, and no longer train you to higher levels. Notice that in this case, I can increase my skill by this enchant, since it is orange, but I need Strange Dust, which is a very low level mat. To help me level my enchanting, I wait near the trainer and the mailbox. Stormvein makes some low level green – uncommon – cloth items, and sends them to me. I disenchant them, and then use the materials to enchant one of two things: Items of my own clothing, or Enchanting Vellum. It turns out that you can enchant an item over and over again with the same or different enchants, so if my high level cloth armor can be enchanted with the enchantment I’m using them I apply it to my cloak or bracers or whatever. And if it cannot be done, for example if the enchant is for a melee weapon, which I cannot use, then I enchant a piece of Enchanter’s Vellum which is special paper that is made to trade enchantments. This paper is cheap and easily available from the enchantment supplier. At one point we did a lot of work to mine metals and forge steel and make breastplates, only to create a lot of items which gave us high level enchantment mats, which may be useful later. Low level Cloth items are much easier to make and are more useful for low level mats. Our brother Adramaden, the priest, is training as an herb gatherer and a scribe. Turns out that scribes can make high level staves, which will be useful weapons as we go to Pandaria. But also he makes lots of other interesting magical items too. But unlike Enchanting, learning “Inscriptions” is straight forward: Collect Herbs at higher and higher levels, mill those herbs into inks, and then use those inks to make inscriptions. Higher inscriptions require higher level inks from higher level herbs. Oh well, I’m sure we can work together to teach me Enchantment, and it will be useful for everyone when I know it. Update: After a few hours, I’m up to level 233 in Enchanting. This was done by working with Stormvein to make the items that I needed to get the magical items I needed. At one point we needed to send out Thalmatos to farm some Linen Cloth, but after a few stacks of Linen, we were using Wool, Rune Cloth and Mageweave that we had saved to level our tailors. 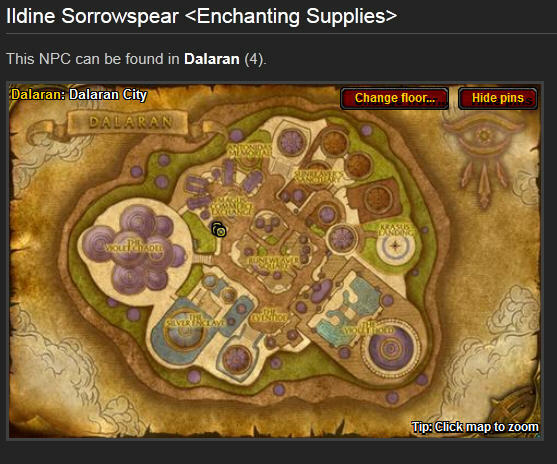 The key to efficient use of time and resources is to pick enchantments that require the fewest materials, and then look those materials up on Wowhead.com, like this: Vision Dust. In the comments you find which items work best for disenchantment. While the White Bandit mask pattern, in this case, is a rare drop there is a pattern alternative that can be purchased from the vendor. The folks here always choose the cheapest patterns to make so you save materials. Another interesting side note is that Enchantments apparently do not have level requirements. For example, a level 25 monk was able to make use of my cloak enhancement for +50 armor. This is a very large increase that more than doubles the cloak for that level character. My goal is to reach level 275 in Enchanting so that I can disenchant the Horned Cobalt Helm to obtain Infinite Dust. Looks like I’ll make this this afternoon. So the whole leveling process to 275 from zero took about 10 hours with a fully trained tailor to help. Cheers. Update: I needed to reach Enchanting 350 to make Infinite Dust. But with help from Kweezlix – our Goblin Hunter who ran Hellfire Ramparts several times for Rune Cloth, and Adamithus, the Paladin, who mined Adamatite so Margrog our blacksmith could make Axes, we made it to Enchanting 350 and can now Disenchant Horned Cobalt Helms for Infinite Dust so that Stormvein can make Frostweave Bags. I’ll summarize the whole process of making the bags in the next post.